Truth Illuminated is a flexible teen pro-life program based on Scripture, the teachings of the Magisterium and on Church Tradition. Truth Illuminated can be structured as a series of stand-alone pro-life presentations, as a complement to existing teen pro-life programs and activities or as a pro-life supplement to existing Youth Ministry programs. The program includes promotional materials, presentations on over a dozen pro-life topics designed for youth and a Teen Pro-Life Boot Camp that can be offered in the summer. Pro-Life?... Join the Club! Start a Truth Illuminated chapter at your parish or school this year. We are an energetic and fun pro-life ministry made up of teens from local Catholic parishes and high schools, co-sponsored by the Diocese of Kansas City-St. Joseph and the Archdiocese of Kansas City in Kansas. 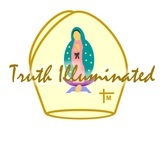 Truth Illuminated is a joint program of the Archdiocese of Kansas City in Kansas and the Diocese of Kansas City-St. Joseph. Below are the current volunteer opportunities for the Truth Illuminated program. Please note “Truth Illuminated” on the memo line of your check. Thank you!